This may send chills down your spine. It should. 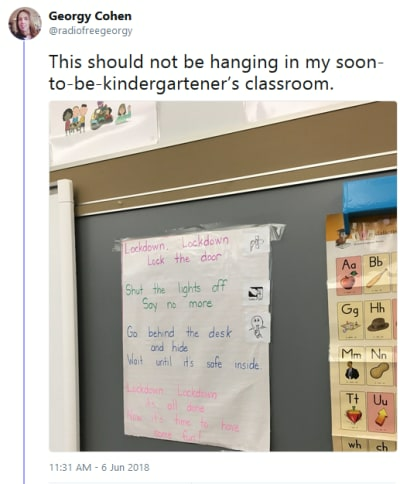 A woman tweeted about a horrifying poem — written to a hauntingly familiar tune — that she saw posted on the wall of her child’s future classroom. 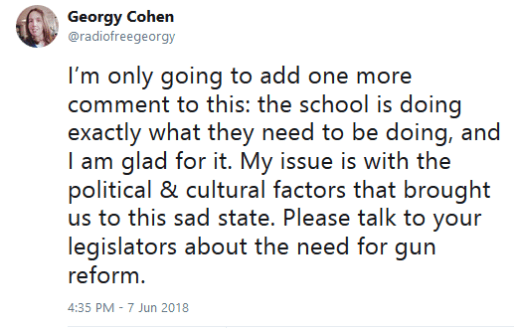 It’s to prepare for lockdowns in the event of a school shooting. That is not uncommon for schools, especially elementary schools that have any sort of partnership with specific pre-K programs or facilities. Parents come in for a sort of open house experience. At some of these events, preschoolers who are soon to be rising kindergarteners are able to see and visualize their future. Everything is so new when you are 4 or 5 years old, so being able to see a classroom in advance can make your future less daunting. Unfortunately, the experience caused quite a fright for a parent after she saw this hanging in a classroom. A chorus of children’s voices singing this sounds like the intro to a horror movie. Some commenters tried to comment that this might be for tornado drills, too. But it is not. Tornado drills send children into hallways, and do not require turning off the lights or remaining silent. 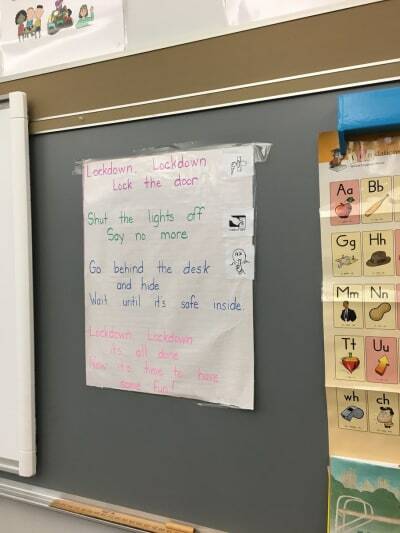 This is to prepare children to hide and fear for their lives in the event of a shooting. To children, death is usually an abstract concept. And it very much should be. For parents and other adults, who can fully understand the creeping dread of a society that allows its most vulnerable citizens to be in so much danger on a daily basis, this really hits home. To be clear, she is not in any way condemning the school or the teacher who wrote the song. As you can imagine, her mentions on Twitter were blowing up. 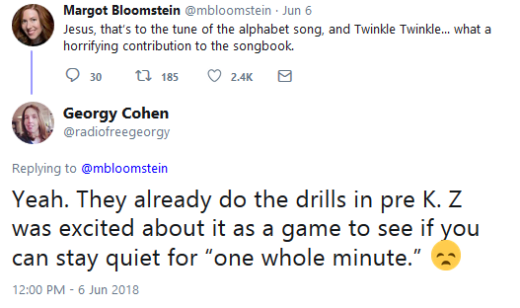 A rhyming song with a familiar tune is great for teaching children to remember simple instructions. Yep. 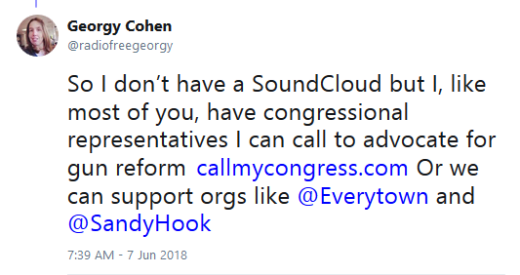 She specifically refers to America’s gun culture and the lack of political action. The tweet’s viral popularity was astonishing. This rhyme was a real shock to the system — which is good, because these horrors should never be normalized. Many people who have a tweet blow up try to garner attention to a personal passion, such as their SoundCloud. The whole world has been horrified by these shootings. Regular folks and celebrities alike. Heidi Montag: Pregnant with First Child!!!!! Johnny Depp Tried to Get Amber Heard Fired From Aquaman?! Ashley Martson Admits to Lying: I Get Paid to Lie, Dummies! Anna Duggar, Fundie Fashion Queen: See How Her Look Has Evolved!